I just realized that it has been some time since I have posted anything. I get involved with so many projects time flies by. Recently, I have been rediscovering PDF slide shows that can be produced from the Slide Show Editor in Photoshop Elements. 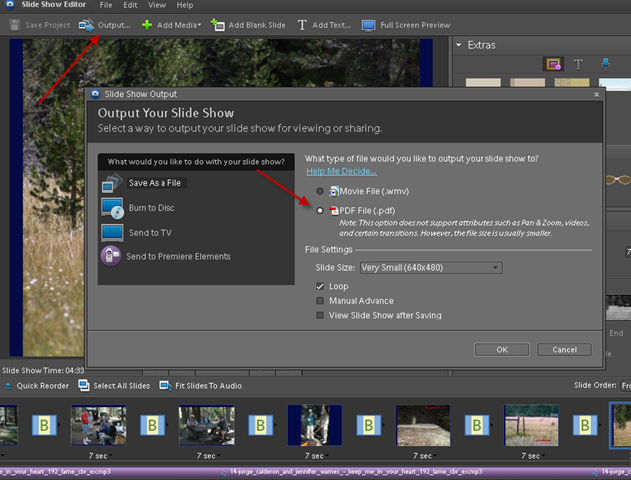 I use the Slide Show Editor a lot, but generally use it as the first step for making a DVD for TV viewing. Normally I do not output the PSE slide show to a PDF file. Reading their basic restrictions stated in the Slide Show Editor’s Output Command basically turned me off. They do not support video files, pan and zoom, and some transitions. It finally registered that there was no mention of music not being supported. I often include background music in my slide shows and generally don’t associate a PDF file with music. Well, apparently the PDF file has gained a lot of additional versatility over the years. I have been experimenting with various formats and picture sharing sites to display some photos from a camping trip last summer. I decided to give the PDF file slide show a try. After the completing the slide show, click on the OUTPUT button as shown in the figure below. Then select PDF in the dialog box. The image size in the PDF file can range from 640×480 up to 1600×1200 pixels. I have tried 800x 600 and 640×480. The 800×600 size looks good on a monitor set for 1024×768 when displayed full screen. The 640×480 is somewhat soft. My particular show included about 40 images with background music and runs for four and one-half minutes. The 800×600 pixel version had a file size of 15.3 Mb, while the smaller one required 12.4 Mb. You probably want to keep the file size down to less than 10 Mb if you are planning on emailing your slide show, and that is assuming they have a high speed Internet connection and are interested in seeing your presentation. To me the big advantage of saving and distributing slide shows in PDF format is that almost everyone has the capability to view your show, even if they are using a Mac. Also, if you post the file you can easily move it from one host to another. Right-Click here to download and view the 800×600 version of my PDF slide show. Or you can left-click on the the link to view it online. Doing it this way, the first image will display and the music will begin to play. But you will have to click your mouse button to advance the images. All recent versions of Photoshop Elements support saving slide shows in PDF format. You may need to update your free Adobe Reader (formally Acrobat Reader) to hear the music etc. I will be using this output more and more in the future. Give it a try. I think you will like it also. Until next time – hopefully not long.